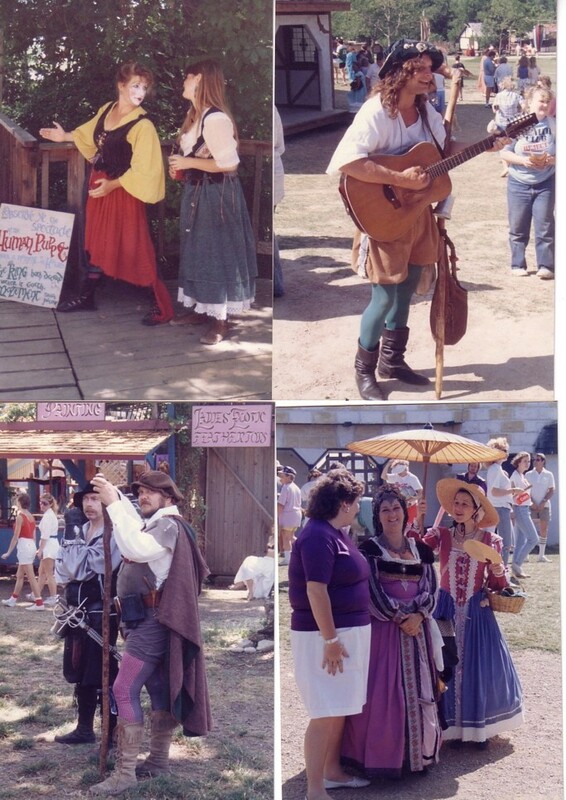 All of these photos have resided in my portfolio since 1988, and were in fact labelled as a "Photo Essay on Scarborough Faire, 1988, photos by Shlei". For those on the Scarboroughfairegoer group, look closely, as some of the subjects mentioned in the July 23-24 posts are indeed shown here. 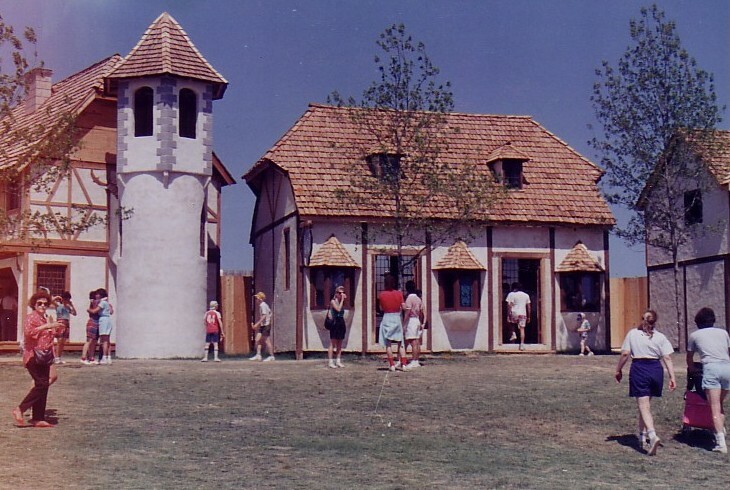 What are now the Souvenir Shop and Artisan's hall - as they were in 1988. They were new that year. 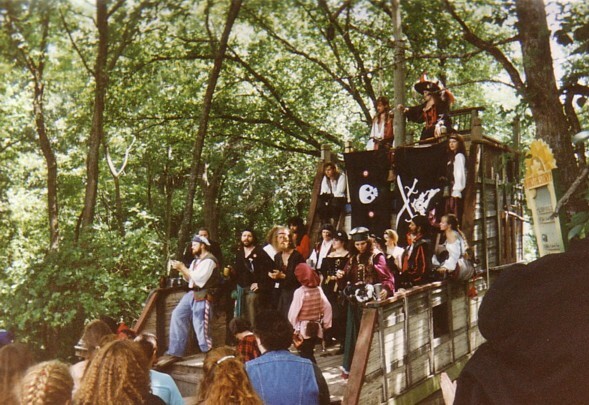 The "Human Puppet/Musicbox) and friend standing on the old Eagles Crossing bridge. Old railings, no carvings yet (this is where ice is now handed out. Balbuga!!! right, Gibbon the Trubadour!!!! Seymour and Rook (Seastrunk and Jacobs). Marilyn Marzella as Queen Anne Boylen, with "Ducky" the mad Dutchess. The parapet as discussed can be seen in the background. The old chessfield. This is looking from the sloped side (Back to the outside wall) across the board. 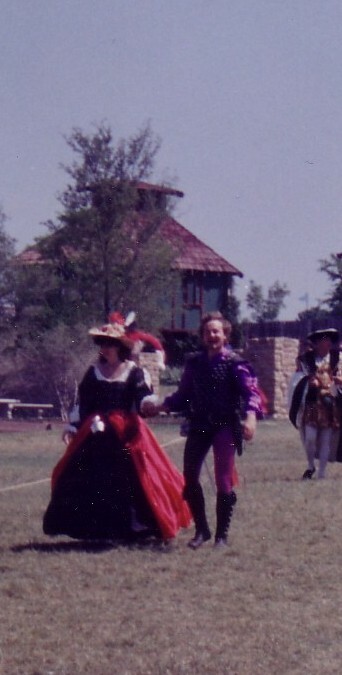 Earl of Warwick is in purple and black tights. 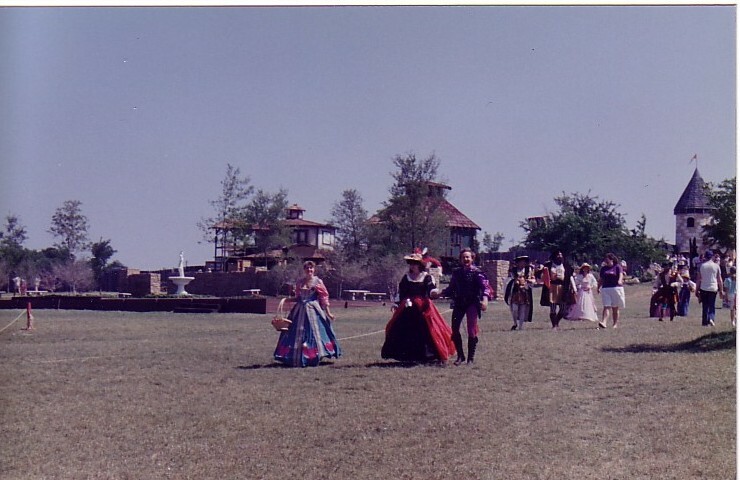 Spectators behind them are in the cut-down walkway behind the field. I strongly suspect this was the first year the Rose Garden was there as well. This statue is long gone, though. 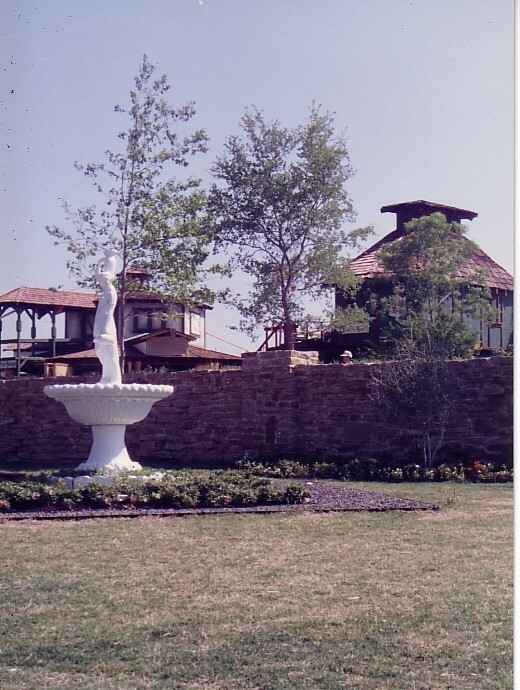 This is looking back at the Rose Garden and past it (buildings are the Costume rental and where the Butterfly Garden are now). Note is is just the one wall so far. 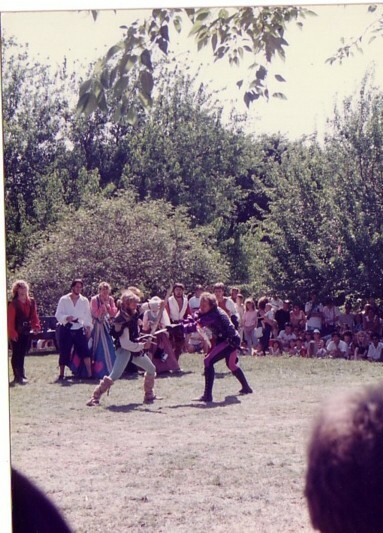 The Catherine as the original stage for the Seahawks. 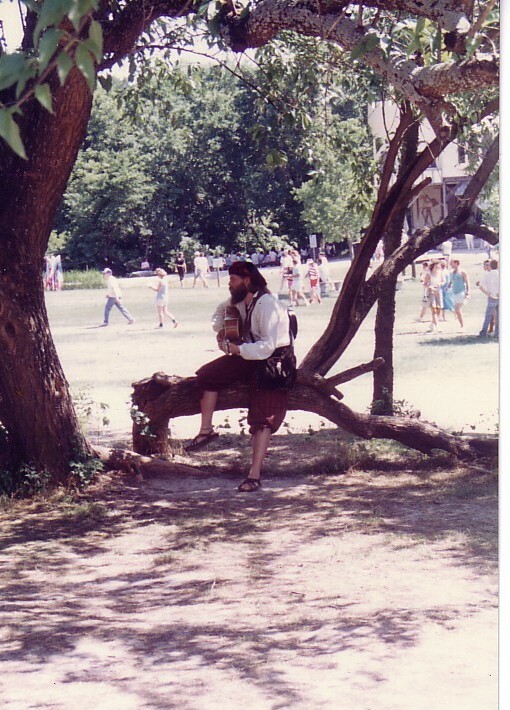 Only a few of these people are still out at Faire - I miss the ship and I miss the crew!!! Above: Someone mentioned a tree-seat? With a wave of the magic scanner... Back is to the outside front wall, looking out into the Hollyfield where the Pirate Ships are now - In fact, a tiny bit of the old Catherine Stage (part one) is just visible over his head. Left - The Stardancers at Front Gate. Left with dark hair is Isis' daughter Tara. 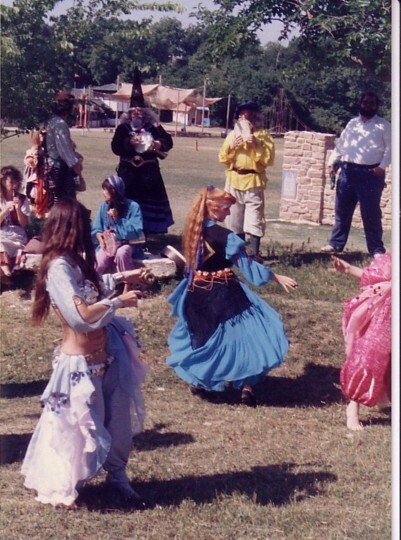 Center with red hair is Carol Seastruck, aka Lady Lee (Sells swords now!) Looking toward the bend and if one looks closely, one can see a suspension bridge type guying where Misting Bridge is now.